In the new century, it is a frontier topic in both physics and astronomy to explore the fundamental physics processes in the very early universe or in the proximity of black hole horizons. Space astronomical observation is one of the most important paths to address these issues. IHEP is leading the development of China’s first astronomical satellite, the Hard X-ray Modulation Telescope (HXMT). It was proposed by IHEP scientists Li Tibei and Wu Mei based on their innovative direct demodulation image reconstruction method. The main scientific objectives of HXMT are: (1) to scan the Galactic Plane to find new transient sources and to monitor the known variable sources, and (2) to observe X-ray binaries to study the dynamics and emission mechanism in strong gravitational or magnetic fields. There are three main payloads onboard HXMT, the high energy X-ray telescope (20-250 keV, 5100 cm2), the medium energy X-ray telescope (5-30 keV, 952 cm2), and the low energy X-ray telescope (1-15 keV, 384 cm2). All these three telescopes are collimated instruments. Using the direct demodulation method and scanning observations, HXMT can obtain X-ray images with high spatial resolution, while the large detection areas of these telescopes also allow pointed observations with high statistics and high signal to noise ratio. 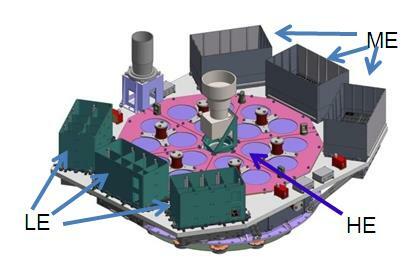 It is expected that HXMT will discover a large number of new transient X-ray sources and will study the temporal and spectral properties of accreting black hole and neutron star systems in more details than the previous X-ray missions. The HXMT satellite is now near the end of the qualification model phase. The manufacturing of the flight model will begin later this year, and the satellite will be launched in 2015.